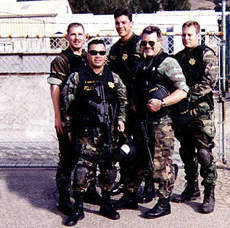 The California State University, East Bay Police Department is a participant in the CSU Northern California Critical Response Unit (CRU), a highly trained unit with representation from most of the CSU campuses. The unit is available upon request to assist CSU campuses with critical incidents, emergencies and disasters. CRU officers are trained in crowd control, dignitary protection, and disaster relief. Since its development in 1993, CRU has responded to CSU Northridge to assist in the aftermath of their major earthquake, provided special security for elected officials and other dignitaries, and has responded to numerous other calls for help within the University system. A special component of the CRU is the highly trained Specialized Entry and Rescue Team (SERT). The SERT officers are trained in high risk building entries and hostage rescue.